LAWRENCEVILLE-- Ever wonder what its like to be in the military. Well, playwright Rance Robeson is here to fill you in. Wednesday evening, Anwar's Reflections attended Rider University's staged reading of the play, A Damn Fool. The play was written by Rider senior, Rance Robeson. The show was held in the university's Spitz Theater. In attendance were Rider students, faculty, and other members of the community. The play's cast included students from various backgrounds. Some from theater, others from the military itself, while others had a background in graphic design. The purpose of the event was to not only give Rider students a much needed break from their school-work as the end of the semester quickly approaches, but the show was also meant to capture a realistic side of what military life is like in some pockets of the world. The play chronicles the day to day lives of soldiers in Iraq. In A Damn Fool, playwright Rance Robeson explores the struggles, disappointments, and deep yearnings our service men and women hold. Yet in the midst of this drama, you also find that soldiers have the ability to hold lighthearted conversations about life. The play sprinkled both joy and sorrow into its narrative. The play's main character, Nelson, makes it a habit to go to what the military call 'sick call'. Here in sick call soldiers get a chance to rest and recuperate from their psychological or physical wounds. However, by being in sick call, these individuals leave their fellow soldiers shorthanded when it comes to fighting the good fight. Overall, the play is marked by its rich characters, dramatic performances, and unmistakable realism. After the play ended, members of the audience were allowed to ask questions to members of the cast. Members of the audience were willing to give feedback regarding the play. One audience member, Desiree, a Rider student said the show was great and that she came because her friend was playing the role of Jones. Another audience member, Jason Rater, an actor himself said, that he enjoyed the play because it had a lot of depth to it and because the characters were sharp. He came out to the show because his girlfriend was playing the role of Patel. Anwar's Reflections will be sure to keep you up to date on any future events at Rider. Below you will find parts of the play on video. For more information, please contact RDR Entertainment at (610) 228-0142. Today, Anwar's Reflections was fortunate enough to sit down with up and coming singer and performer Rodney Talley. For those that don't already know, Talley, a Philadelphia native, has been fine tuning his craft since he was just a teenager. Nowadays, you can find the multifaceted artist not only singing or performing, but also mentoring, teaching, and choreographing for different ministries nationwide. During our interview, Talley discussed his debut album Revelation, the artists that influenced him, and much more. Talley has a soulful sound and a positive message that is sure to not only entertain but also move you. 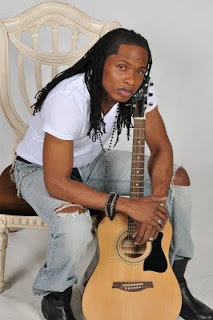 During the interview, Talley mentioned that with this new album, he wanted to connect with an audience that yearns for a more progressive-R&B gospel sound. Trust me, Talley is an artist you don't want to miss. His album is scheduled to be released April 26th. Revelations can be bought through cd baby, Amazon, and selected stores. For more information, contact RDR entertainment at (610) 228-0142. 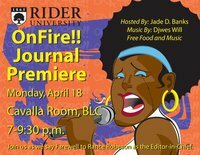 LAWRENCEVILLE-- Ever wonder what a poet, an essayist, a DJ, and a photographer are doing in one location, well the On Fire staff at Rider University have got the answer for you. Tonight, Anwar's Reflections attended Rider University's On Fire Journal Premier. The purpose of the event was to give Rider students and alumni an opportunity to perform their work and express themselves in a comfortable atmosphere. The journal was created just three years ago. The mastermind behind the journal's creation is Rider senior, Rance Robeson. His vision to create On Fire emerged out of a genuine desire to bring the Rider community together at a time when the school was facing acts of hate. At that particular time, a student on campus was victimized by an act of hate where someone spray-painted a racial epithet on the wall of her dorm. 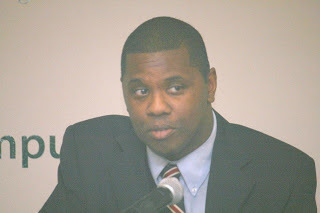 Three years later, Robeson's idea grew tremendously, and now we find On Fire flourishing. This is the journal's seventh edition. Up to now, there have been 116 people that have contributed to the journal. From photography to poetry, the On Fire Journal Premier has consistently revealed an eclectic blend of skill and ability. During Monday night's event, one student, Peter DeFranzo, performed a piece called Underage. 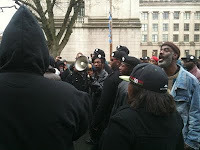 Another student, Aamir Hayes, recited a poem entitled, Let's Start This Revolution. Rider alum and playwright, Reggie Walker, performed his piece, Love On Mute. During the premier, students, members of the community, faculty, and others were invited to the stage to do the electric slide, which has become a customary event over the last couple of years. However, this year there was a slight twist, after everyone tried the electric slide, members of the audience came on stage to do the "dougie", a new dance inspired by the hip hop group Cali Swag District. Before the event began, snacks and refreshments were served. Well-known DJ Wes Will was on the one's and two's providing musical entertainment. The event was hosted by Jade Banks, a New York based author and poet. The event was held in the University's Cavalla Room. The evening had a somewhat somber tone at different points because On Fire's editor and chief, Rance Robeson, was participating in his final journal as a student. He is scheduled to graduate May 13th, he is the commencement speaker for the 2011 graduating class. Members of the community, students, and Rider faculty were all in attendance. One audience member in particular, Helen Cheung, a Rider student, said the show was "a great success". Another audience member, Leslie Taylor, a Rider alumni said she "enjoys all the On Fire premiers". Yet another audience member, Jennifer Orlosky, a Rider student, said that enjoyed the show. In particular, she said that Reggie Walker "killed it" during his performance. 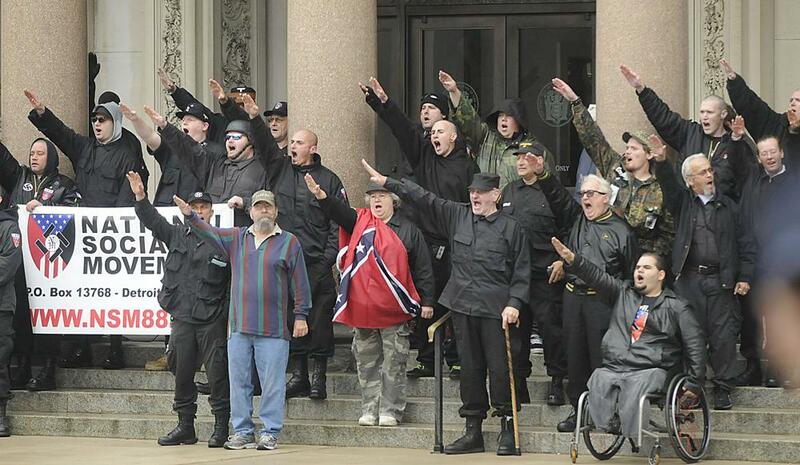 TRENTON-- Just when you thought the Nazi's were a thing of the past, they surprisingly come back but just under another name, the Neo-Nazi Party. Saturday afternoon, members of the Neo-Nazi party convened at the state house to protest high taxes, illegal immigration, and crime. Supporters of their movement suggest that they have a right to free speech. Opponents of the Neo-Nazi march suggest quite the contrary. They argue that their message promotes hatred and bigotry. During the Neo-Nazi protest, individuals waved flags with Nazi insignia which provoked strong protest from by members of the Trenton community, students from the College of New Jersey (TCNJ), and the New Black Panther Party, among others. Anti-racism activists were vocal about their opposition as the videos below will indicate. To access the Nazi March, individuals had to go through metal detectors and be padded down by state troopers. On site, there were a great deal of police officers, both city and state. 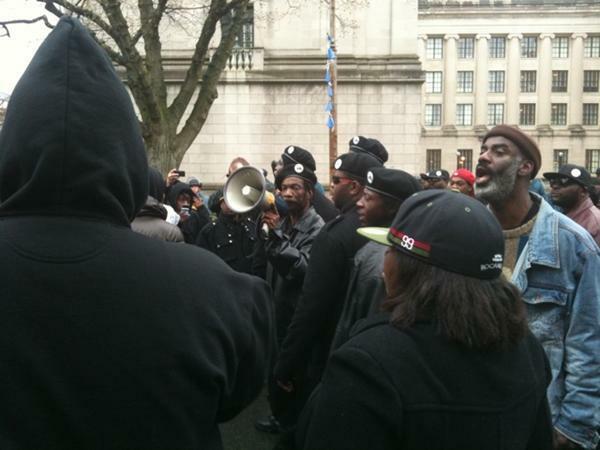 New Black Panther Party spokesperson, Divine Allah, was recorded saying that having this many police on hand was a clear waste of tax payer money. At one point during the protest, Allah said that he and the New Black Panther Party are against white supremacy, police brutality, miseducation, and poverty. LAWRENCEVILLE-- Ever wonder what's its like to be governor, well former New Jersey Governor Brendan Byrne was at Rider University Thursday evening to fill the audience in on what exactly that entailed. 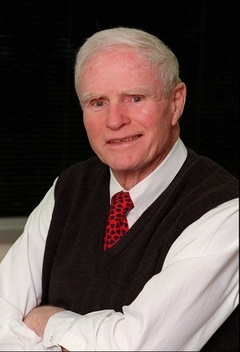 Tonight, Anwar's Reflections attended Rider University's conversation with former New Jersey Governor Brendan Byrne. Governor Byrne was interviewed by Chairman of the Political Science Department, Ben Dworkin. Byrne answered a series of questions about his tenure as governor. From the inauguration of New Jersey's state income tax to his landmark decision to have casino gaming in Atlantic City, the former governor demonstrated not only his understanding of the critical issues of his day, but also his unique sense of humor. As a matter of fact, at one point during the dialogue, Governor Byrne said jokingly that it was not his idea to have the Meadowlands arena named after him, but he did want the race track to be named "Byrne Downs" in his honor. Members of the audience chuckled. Later during the conversation, the former governor went on to say that despite being the chief executive of a state like New Jersey, he never thought about running for anything on a national level even though many people suggested that he should. He characterized his gubernatorial management style in no uncertain terms by saying that if he wanted something done, his staff better get it done. The two term governor went on to mention that despite his long career in politics, he is neither jaded nor cynical about the current state of politics. He rhetorically asked, "Why did you take this job [public service] if not to make a difference?" Governor Byrne also answered questions from students in the audience about the current tax structure in New Jersey along with his suggestions on how to address issues facing public education. Byrne said that Governor Christie needs to bend on his no new taxes campaign promise because the current tax structure is in need of reform. 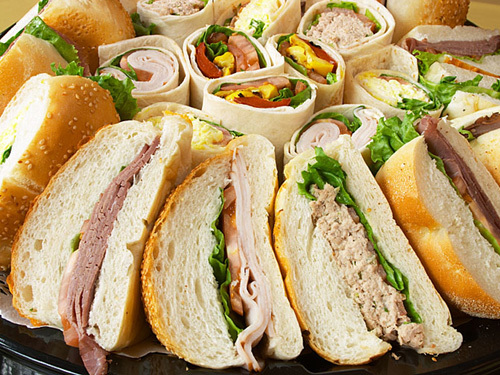 The dialogue took place in Rider University's Mercer Room at 7 o'clock.There was a hour long reception that preceded the conversation that gave event patrons an opportunity to mix and mingle while enjoying snacks and refreshments. The event was hosted by the Rebovich Institute for Politics. Students, members of the community, and Rider University staff were all in attendance.There was a brief question and answer period following the dialogue. Anwar's Reflections was there to capture what the audience had to say about why they decided to come to the discussion. One member of the audience, Christopher Natero, an American Studies student, said he enjoyed previous Rebovich Institute events because they were "engaging". During the reception, he told me that he comes to these sorts of events because "its not just the professors talking, they let the students get involved in the discussion and ask questions, its really open to ideas and new things, not just something like a lecture". Natero went on to say that he came to the Byrne event because he "wanted to see the experience and what it takes to climb up the ranks in politics". Another audience member, Dr. Harvey Kornberg, a Political Science professor at Rider, was quoted saying that he went to the event because "he was interested in seeing Governor Byrne because he is a favorite of his." Yet another audience member, Bob Kenny, a lawyer and adjunct professor at Rider, said that he just wanted to hear him [Governor Byrne] speak, because he's an entertaining speaker. Kenny went on to say that these sorts of events are important for the university because they discuss issues that are "worth exploring". He also said these sorts of events carry on the work of the late Dr. David Rebovich. Alexandra Laperry, a junior that is studying International Business, Economics, and Global Studies at Rider, said she took off work to attend the event. Laperry indicated that she attended previous Rebovich Institute events and enjoyed them all because they were "informative and the atmosphere was always nice". She went on to say a big reason she decided to attend the event was so she could get an idea of what Governor Byrne's outlook on things were and because "he did a lot of things for the state". Anwar's Reflections will be sure to keep you up to date regarding any future events at Rider. TRENTON- Looking for a tasty sandwich for lunch or perhaps you're in the mood for enjoying a laid back atmosphere where you can read the paper while enjoying a scrumptious meatball parm. Well, look no further than Trenton's Downtown Deli on Warren Street. Today, Anwar's Reflections was fortunate enough to sit down with the owner and operator of Trenton's own Downtown Deli, Lavalle Williams. For the interview, Williams and I decided to sit in front of his shop and discuss his passion for serving the public by providing quality food at affordable prices. 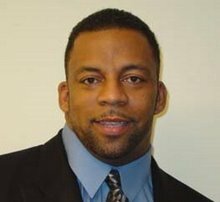 TRENTON- Today, Anwar's Reflections sat down with political activist and founder of the hard-hitting political blog, Today's News NJ, Daryl Brooks, at the Marriott Hotel located in the heart of Downtown Trenton. Brooks and I spoke for an hour and ended up discussing a variety of topics, including the role of city government, state politics, national affairs and much more. TRENTON-- Today, Anwar's Reflections-- a Trentonian affiliate-- was fortunate enough to interview well-known Trenton rap artist, Big OOH. 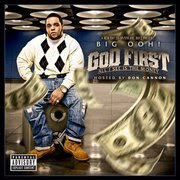 During the interview, OOH discussed his passion for rap music, the artists that have inspired him and much more. OOH, a hometown favorite, has appeared on Power 99 with Cosmic Kev along with other well-known radio stations. He has performed everywhere from Boston to Trenton. Rider University students at last years Run Over Violence 5K Run. LAWRENCEVILLE, N.J. - Its that time of the year, get your running shoes ready because Rider University is hosting its Third Annual Run Over Violence 5K run. The event will be hosted by the on campus club, Rider Runners. The event is scheduled to start at 9am this Sunday on the Lawrenceville Campus. The event’s primary purpose is to raise awareness of domestic violence as well as gather donations through Womanspace for the cause of both sheltering and rehabilitating those who have been subjected to domestic violence. However as the event has grown each year the 5K has also become a place for people to network and promote their club through co-sponsorship. Rider Runners over the past two years has aimed to create an event in which both on and off campus organizations could network, bond, and promote their group. The Run Over Violence 5K’s registration will start at 9am where people can mingle and network up to the start of the race which is at 10am. The award ceremony will be at 11am, those who choose to stay around can continue to meet and greet with the many organizations involved in this year’s 5K. Between the on campus clubs such as LDP, On Fire, MASA, Law Society, JPCS, as well as the off campus businesses and organizations such as Deloitte, PNC, Americans for Financial Independence, Princeton Running Company, Road ID, and more the 5K has raised over $2,000 and expect to raise even more on the day of the event. Rider Runners is a Rider University club sport on campus whose mission is to provide a supportive environment for those who wish to pursue running and fitness as well as being involved with their community’s 5K events. For more information about getting involved with Rider Runners or registering for the Run Over Violence 5K please contact Louis Chebetar at chebetarl@rider.edu or (914) 572-5129. 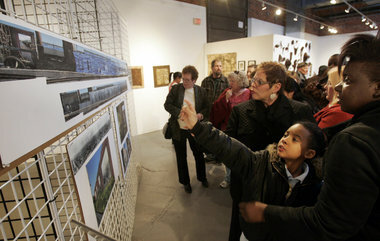 Local Trenton residents take a peek at mural designs for the mural arts project. TRENTON-- Let's paint Trenton a better picture, that was theme of the day, this past Monday, as local residents came out to take a peek at what the Trenton Mural Arts Program (TMAP) is doing. TMAP invited residents of the community to come and see its mural designs for several buildings that are currently owned by the Home Rubber Co. on Rt. 29 in Trenton. Mayor Tony Mack and others from the community were in attendance this past Monday to show support for the unveiling of the new mural design. The unveiling ceremony was held at the Artworks Gallery in Trenton. Prior to this event, Mack said that this sort of gathering was like seeing his dream come true. In this particular case, it has been found that the city has chosen to have a muralist that was not from the city of Trenton, but rather the city of Brotherly Love. The name of the muralist is Phillip Adams, he is Philadelphia-based. I applaud what the Trenton Mural Arts Program (TMAP) is doing. I do believe the city of Trenton needs the arts like people with the common cold need those nifty zinc lozenges, i.e. desperately. However, putting rhetoric aside for a moment, what I do take issue with is the fact that Trenton's own muralist Will 'Kasso' Condry was not chosen to take part in this project. Indeed, Kondry has a long history of creating murals in the city that have truly beautified Trenton. Yet he, a Trentonian, seems to have been completely overlooked for this sort of position. This state of affairs begs or evokes a larger question: how many development jobs are taken by outsiders instead of born and bred Trentonians? I understand that we live in a globalized world where everyone is interconnected and where talent seems to be found any where it is located, yet we must never forget the unemployment rate in cities like Trenton is 13.8% alone compared to the national average being 6.9%. My goodness, believe you me, those numbers are staggering. Something truly needs to be done by our locally elected officials to reduce this unacceptable statistic. Let's be quite frank, if we can't give people jobs due to their lack of skills, it seems to me that the only logical or sensible thing to do from a policy standpoint, is to provide programs and services to these young men and women that will promote knowledge and skill development. Shouldn't Trentonians have access to these jobs if they live here. Our elected officials need to remember what psychology 101 teaches us: if people perceive in their hearts and minds that they are heavily invested in their community, they undoubtedly take greater pride in that same neighborhood they live in. This pride in the community can be demonstrated in a variety of ways. First, with cleaner streets. Second, with citizens being more vocal about problem schools, crime, and the like. I think greater pride in social affairs can and will promote a more dignified standard of living where people have no problem recommending Trenton as a place to live, work, or go to school. (However, please don't get me wrong, I am not downplaying the many positive forces in Trenton, because trust me, there are many positive folks in Trenton, all one needs to do is take a look at some of the people that have been interviewed on this blog to verify that fact, the only thing I'm pointing out is that there are individuals out there that give the city a bad rep).